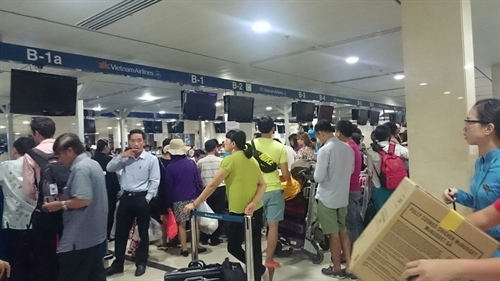 HA NOI – An alleged Chinese hacker group carried out several cyberspace attacks on Viet Nam’s two biggest airports and the official website of the national flag-carrier Vietnam Airlines this afternoon. During the time of the cyber attacks, passengers at Noi Bai and Tan Son Nhat International airports used their smartphones to record clips of screens at the airports’ check-in areas displaying pictures with words insulting Viet Nam and the Philippines regarding the East Sea (South China Sea) dispute. These videos were posted to Facebook and quickly went viral. The hackers also took control of the speaker system at Noi Bai airport for a few minutes, during which the speakers broadcast a male voice distorting Viet Nam’s claims over the East Sea in English. The hackers claimed to be the 1937CN from China, which is one of the biggest hacker groups in the country and has a history of hacking Viet Nam’s and the Philippines’ websites in 2013 and 2015, respectively. Airport security forces soon regained control over the hacked screens and speaker system. 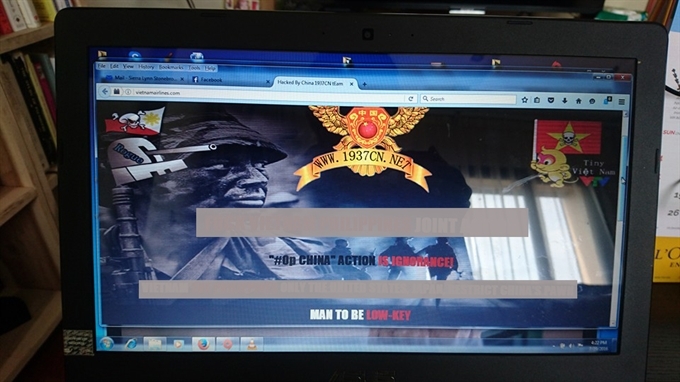 The official website of Vietnam Airlines, vietnamairlines.com, was hacked by the 1937CN group at about 4pm the same day. The website page was replaced by the same picture that appeared on the airports’ screens. The website was back to normal at 5.10pm, however, the airlines’ customer database was stolen and made public on the internet, according to a press release from Vietnam Airlines. The airlines advised its members to change their account passwords as soon as the network system is recovered.